The work produced during my participating in a residency program in Biella, Italy. I could start the residency program because a Rwandan artist could not make it because of his visa trouble. For the program, I had proposed to make a video work about a missing woman in Biella. However, instead of finding a missing woman, I became to find that I also had a problem of visa. Tired of the full burdens of immigration system that I experienced and the conflicting information I would get from bureaucrats operating in an opaque process, I decided to leave the program earlier without participating in the final show and to make all this process as my project in Biella. This work consists of 5 of the Rwandan artist, Minani's photos, his video work, which he wanted to reproduce in Biella,16 photos that I took in an immigrant office in Biella when I had to spent an entire day there to sort out my visa issue, my statement written on the wall, which explains why I decided to leave early, and my missing. Everything was installed on my desk at my studio place, which I had occupied during the residency. The taste of freedom, single channel viedo, which Jean dieu de Minani wanted to reproduce in Biella, Italy. 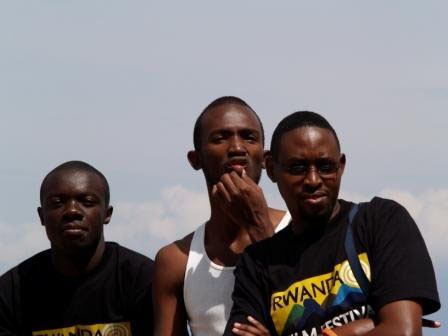 On the first day of UNIDEE’s 2009 residency, June 15th, I received an e-mail from the UNIDEE office offering me a place in the program, one originally offered to a Rwandan artist who could not accept it due to a visa issue. His problem was my good fortune – I took over his grant and his residency. However, soon I ran into visa trouble myself. Though I could enter Italy and stay for 90 days on a tourist visa, this was not enough time to complete the UNIEE program. Luckily or unluckily, I received bad information from an officer in Questura di Biella. I was told that I could extend the 90 day period by spending an equivalent number of days outside Italy. In other words, I could complete the program if I would spend a couple of weeks in London or Paris. This was not true. However, I only discovered that this was not true in September, with only 30 days were left. As a result of bad advice and a byzantine visa system, I have spent a lot of my time in Biella sorting out my visa problem. In the face of the conflicting information I would get from bureaucrats operating in an opaque process, I found myself experiencing the full burdens of the immigration system. I came here, Biella, Italy, to pursue my project, which is to uncover a missing woman in Biella. However, as a Carabinieri commander put it, there seem to be no missing Italian woman in Italy. The only things missing are a Rwanda artist, Jean de Dieu Minani, and 9 days for me to complete the program. Again, because of a loophole in Italian law, there was a way around my predicament: I could obtain a dichiarazione di presenza dated a month after my actual arrival date. However, all the trouble I had encountered so far made me doubt the ability to navigate within the system, and I didn’t want to risk any additional complications. Therefore I made a decision to leave according to my visa, a few days short of completing my program. I do this for two reasons – a selfish reason, to be able to travel freely in Europe, and a principled one, to illustrate the way the system functions. I do not want to give up my right to come back to any Schengen country in near future. I do want to show what this process does for a real person, and what it means for the basic right, the human right, to travel freely.